Modernized adaptations of classic pieces of literature have always been a crapshoot, since their themes and dramatic overtures can get watered down in the updates leveled on the setting. There's something universally impactful about the framework of certain ancient Greek tragedies, however, that transcend the period within which they take place, centered on enduring moral conflicts and malleable story developments that can effortlessly apply to contemporary standards. One of such positive examples is Phaedra, in which Jules Dassin, the mastermind behind Rififi and The Naked City, brings his classic noir mystery sensibilities and build-up to a solemn tale of family turmoil, forbidden passion, and the dangers of becoming obsessed with business. 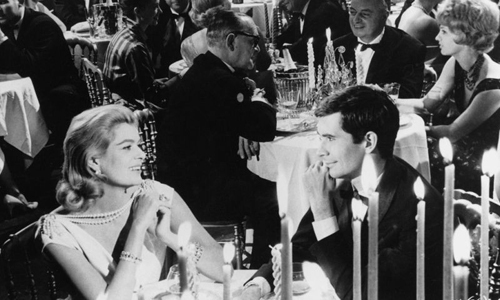 An enlivened, humorously impish performance from Anthony Perkins brightens the otherwise solemn affair, one that's told classically and elevated by stunning visuals, though Dassin's craftsmanship can't quite raise Phaedra above the foreseeable course charted by its tragic intentions. Working form a screenplay penned by Margarita Lymberaki in which she adapts Euripides' play Hyppolitus into a modern melodrama, Dassin turns the spotlight onto the prestige of Grecian shipbuilder and baron Thanos (Raf Vallone). He's the type of tycoon who thrives off his business ventures and shows great bursts of enthusiasm for his life, yet won't hesitate in abandoning a social situation or individual if an opportunity calls. One of such people he abandons is Phaedra -- played by Dassin's collaboration partner and eventual wife Melina Mercouri -- whom, despite being proposed to on the evening of his latest ship christening, has grown tired and unsatisfied with his constant pursuits and time away. The consequence of yet another of Thanos' business trips puts Phaedra in the position of entertainer and custodian for his son, Alexis (Anthony Perkins), who has himself abandoned his business training for a career in painting and art. Thanos hopes that Phaedra, while escorting him from London to Greece, might convince him otherwise; Alexis, instead, ignites passion in Phaedra, of more than one variety. Dassin and Lymberaki put their creative gears in motion while adapting the Greek tragedy of Hyppolitus for the modern era, finding ways to work its seaside setting and disquieting subject matter into a functional contemporary tale. To do this, they've also resorted to the pitfalls of classic Hollywood exposition in getting across Thanos' aspirations and to emphasize the rationale behind Phaedra's sullen demeanor. By design, the story's introduction launches with tonal iciness and obscurity hinged on how these characters harbor unappealing facets within their personalities, and in combination with this rigidly-introduced exposition, the beginning of Phaedra weighs down the drama from the moment it leaves port. There's adventurousness and attractiveness to be found in how Dassin captures the bittersweet glances between Thanos and Phaedra with a huge engagement ring separating them, yet it's built for curiosity over how Phaedra handles neglect and monotony. Despite Melina Mercouri's melancholy performance, Phaedra draws intrigue without earning enough compassion to give it weight. That same weathered, despondent attitude that burdened Melina Mercouri's performance at the beginning of Phaedra becomes a crucial and poignant facet once the weight of the tragedy starts to pull the story back down . While the moving parts of Thanos' shipbuilding empire become a dull, mechanical means of elongating the story and shaping Alexis' character, the conflict that arises between him and his soon-to-be stepmother becomes a gripping exercise in emotional evolution, taking place in the textured labyrinth of Grecian stairs and buildings. Perkins' malleable sweetness masterfully sours and hardens as his character adjusts to the reality of his situation, while the growing depressive depths of Phaedra's perception of the two men in her life emerges through subtles outbursts of vexation. The real interest here becomes how they'll respond to one another whenever they come in contact over and over in different contexts, to which the film meanders with bulky business diversions and halfhearted distractions for Alexis in between those meetings. One could argue that Dassin and Lymberaki may have overly tempered the intentions of the original Greek tragedy, though. After wading through conflicts of parental legacy, business etiquette, and unmentionable romance that ebb and flow with the story's forward motion, Phaedra eventually reaches its destination at a similarly downhearted conclusion to that of Euripedes' play. Underscoring plights of hopelessness and disgrace through a mixture of Anthony Perkins' brazen acceleration into moodiness and Melina Mercuri's more causal descent into futility, the climax belts out big, brassy notes driven by bloodshed and mania that collide with the overarching purposes of the tragedy. Similar to the focal nautical baron Thanos himself, Dassin's take on the Greek tragedy often works too hard to achieve its goal of expanding the classic play into a modern narrative, and hopes that its few displays of overzealous enthusiasm about the tragic outcome will make up for broad disinterested expanses.